The Asia OA Meeting will provide an opportunity to learn about global trends, share information across Asian countries, and help with local strategies for increasing the adoption of open access and open science in your country and in Bangladesh. 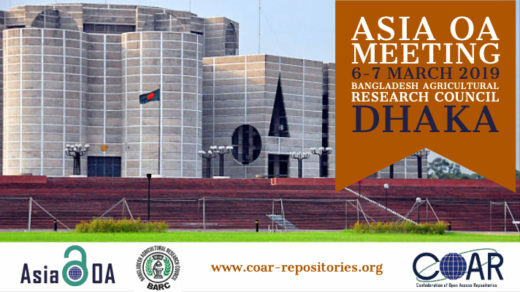 We will present the latest development related to the COAR next generation repositories initiative and hear about the work being done in other countries in Asia and beyond. The meeting will be hosted by the Bangladesh Agricultural Research Council in Dhaka, Bangladesh. Registration is free. Register here! Hotel and logistical information is available here.